Jason Rezaian and his wife visited the Washington Post news room today. Jason Rezaian was welcomed back to The Washington Post newsroom with a standing ovation on Wednesday. The visit was Rezaian's first time at The Post since being freed from an Iranian prison earlier this month. 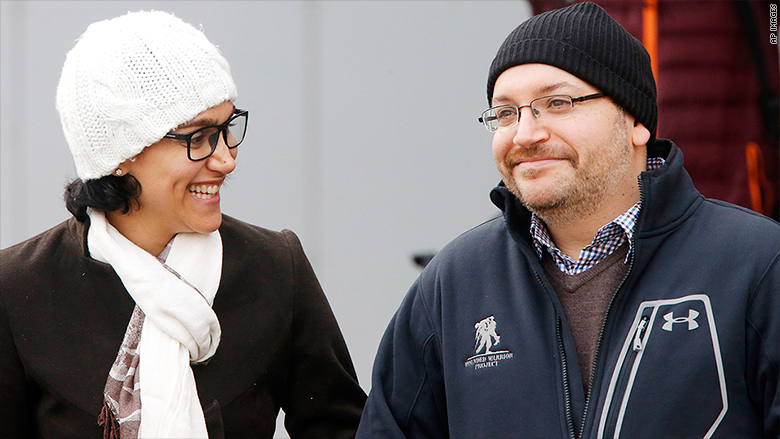 Rezaian was detained by Iran for almost a year and a half. He was released as part of a prisoner swap between the United States and Iran. After spending several days at a U.S. military hospital in Germany, he flew home on Friday on a private jet with Post owner and Amazon CEO Jeff Bezos. His visit to The Post was not formally announced, but several staff members shared information about it on Twitter. Post tablet edition editor Andrew Heining posted a picture of the standing ovation in the Ben Bradlee Story Conference Room. News editor Eric Rich called it an "emotional moment." The Post just moved into a brand-new headquarters building on K Street in Washington. The newspaper is holding a grand opening ceremony on Thursday morning, so there is a possibility Rezaian will attend. When asked about his visit on Wednesday, a Post spokeswoman said, "He stopped by the newsroom and sat in on The Post's 9:30 a.m. news conference with his wife Yegi and brother Ali, where he was welcomed with a standing ovation. He was then able to make his way around to get his first look at the new newsroom and say a private hello to friends and colleagues." Some of those colleagues shared their joy about Rezaian's visit. National reporter Wesley Lowery tweeted, "great to see Jason Rezaian walking through the WaPo newsroom this morning." And higher education writer Nick Anderson wrote, "Just shook Jason Rezaian's hand. Thrilled to see him and his wife, Yeganeh, back in the newsroom!" Just shook Jason Rezaian's hand. Thrilled to see him and his wife, Yeganeh, back in the newsroom! Rezaian has indicated that he plans to speak and write about his experience behind bars at some point in the future, but that he's in no hurry to do so. In a statement last Friday, he said, "I am overjoyed to be reconnecting with my family. I am feeling well and plan to relax and enjoy home-cooked meals, sports, and movies with them over the next few days and weeks."